To say Libby Hunter is an inspiration is an understatement. 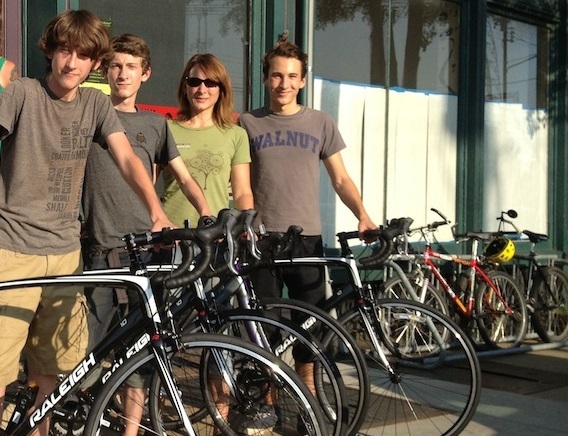 Once the recipient of donated Raleigh bikes, this Great Starts Ambassador and her sons are now payin’ it forward — volunteering at a neighborhood co-op and motivating friends to discover the thrill of mountain biking. We chatted with Libby and discovered how this mom-of-three shares her love of cycling. Riding on used bikes was nothing new for the Hunter’s. Her boys (Isaac, age 17; and twins Evan and Owen, age 15) all had beater bikes they’d built from parts at the local co-op. A great way to learn about wrenching, but not so great for getting around. Even Libby rode around on her 20-year-old Cannondale mountain bike, swapping the knobby tires for slicks when she needed to. That all changed the day they received brand new bikes from Raleigh. Right away, Libby’s boys started biking to school more often and go on much longer road trips with friends…and with their mom. One of Libby’s twins volunteers at their bike co-op, MoBo, which helps kids from low-income families earn a free bike and learn how to work on it. Her oldest son started organizing regular trips to their rails-to-trails bike path. And her other twin has set a culture among his friends to use their bikes for transportation instead of relying on mom and dad. As for Libby, she’s inspired two friends to enroll in a 3-day mountain biking clinic with her, bringing even more biking love to the trails!